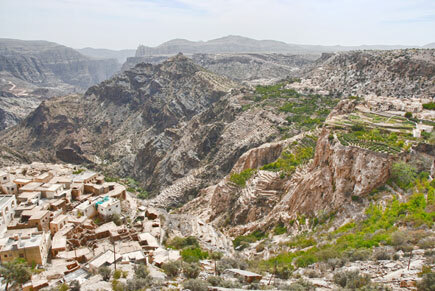 I think Ali must have read my post from yesterday because before I knew it we were on the road to Jebel Akhdar (meaning Green Mountain) – a 1.5 hour drive from Muscat to the base of the mountain. Once through the check point (you need to show your driving papers and ID card and a 4 wheel drive vehicle is a must) we were soon climbing through the dramatic terrain along a switch back road with numerous hairpin bends. It’s a paved road which has been upgraded since we last went up so it’s a relatively easy drive with plenty of places to stop for photographs. At the highest point it’s 2090m so we climbed a cool 1440m. And cool is the right word because at the base it was 38C and at the top 22. Which reminds me, note to Ali: I won the “guess the temperature drop” game so what’s my prize?! There are a couple of new lunch options at the plateau on top of Jebel Akhdar including some covered picnic tables close to a café and children’s playground. We decided to eat at Jebel Radhwa Restaurant where the food was delicious and the setting a traditional Arabic eatery. And then we went in search of the view at Al Fayyadiyah. You’ll need a map to find it but the search is worth it. This was the spot that the late Diana, Princess of Wales visited and you’ll see why when you get there. There are mountains as far as the eye can see. Villages perch precariously on cliff edges and neat cultivated terraces adorn many of the slopes; a photographers paradise! It’s also a great place to camp and we were happy to chat to a group of German tourists who had pitched their tents there. They’d been in Oman 10 days camping and hiking from Salalah to Jebel Akhdar, walking more than 3 hours a day and driving between each camping location. At the lookout, we also met a group of Asian tourists who’d come over from Dubai for the weekend. 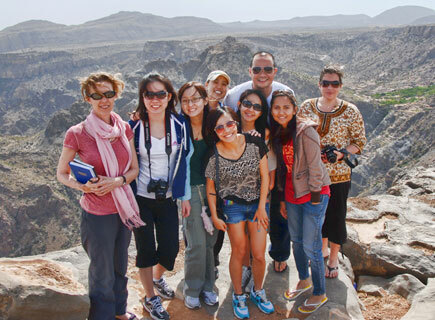 They were very surprised to learn about our trip and were interested to know more about the Friendship Arabia tours. We have Yahya Al Kiyumi, former employee of the Ministry of Tourism, to thank for our Manama to Muscat Tour as it was his brainchild. A general conversation with Ali about the Friendship Arabia tours set the ball in motion because it suddenly occurred to Yayha that it would be ideal to drive between the 2012 Capital of Arab Culture to the Capital of Arab Tourism 2012. His hard work introducing us to our sponsor Omran made everything possible. We are very grateful for his commitment to and confidence in the team.